While Walking My Dogs | Ideas, Inspiration and Instruction… all thought of while walking my dogs. First of all, I’m sorry I missed yesterday. I had every intention of writing a post, but came home from an appointment not feeling at all well. I was afraid I was coming down the the flu, but all I needed was a good night’s sleep. Thankfully. So today I thought I share a couple of my favorite apps at the moment. The first is the Libby app. Libby is a reading app for borrowing digital books and audiobooks from your library’s OverDrive collection. This free app, created by OverDrive, is available for Android, iOS (iPhone/iPad/iPod touch), and Windows 10 devices. I have it installed on the iPhone and my iPad mini. You do need to have a library card and if your library has a digital collection, you can access through the Libby app. While I love reading actual books, it’s really handy to be able to find a digital book and begin reading right away if it’s available. You can place books on hold and the app automatically downloads the book when it becomes available. You have it for 3 weeks and can return it early if you want. The other is the Brainsparker app. “Brainsparker is a creativity app designed to spark your imagination, disrupt your routine thinking and trigger your brain to come up with new ideas and better solutions.” It’s free to download and comes with a set of “creativity cards”. You can add their whole pack collection for only $3. It includes a blogger’s pack, coach’s pack, and journal, quotes and words packs. You can set up the app to prompt you with a daily Brainspark and who doesn’t need that! I can get stuck in a rut with my thinking and it’s nice to shake things up a bit every now and then. The only app I need is the one that feeds me kibble and walks me. Oh wait, that’s you mom! My day ended up being a bit of a rabbit trail today… all because of a YouTube Video ;-). There are a few things in life I can’t seem to get enough of… boxes, glitter, yarn, dogs and stickers. Today I’m focused on stickers ;-). I have always loved stickers. There was a time when there were stores devoted to stickers. Like a candy shop, you could browse the rolls of stickers and buy as many as you wanted in all sizes, shapes, colors and themes. Sticker only shops don’t exist any more, but my love of stickers hasn’t waned. 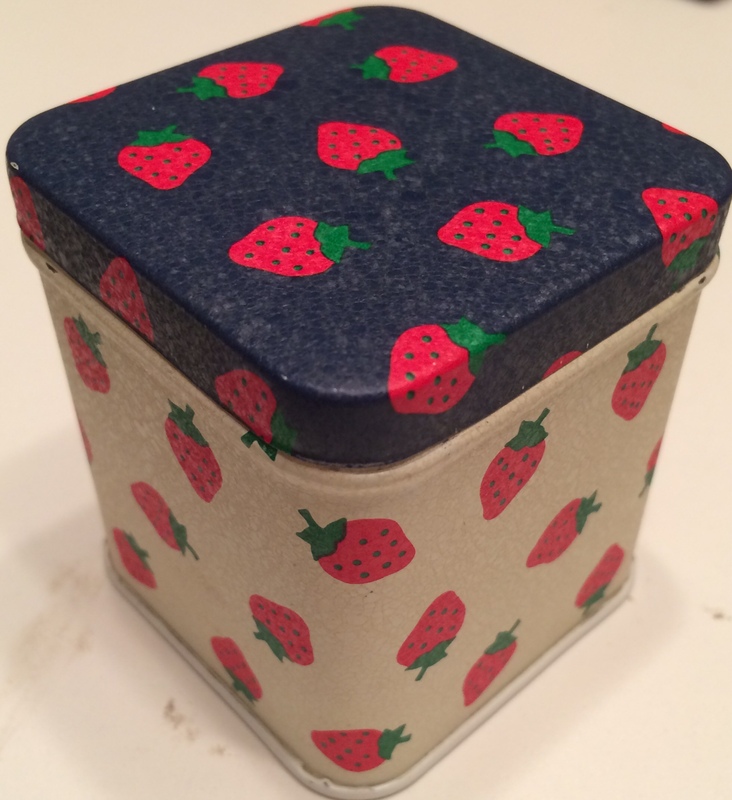 I remember in high school my closest friend came home from a family vacation with a little strawberry covered tin. It was a gift for me and it contained stickers. I still have that tin and the memories of how happy that gift made me. My friend had no idea how much I loved stickers or how thoughtful her gift was that 35 years later I still have the tin. For a while now, I’ve been looking for an efficient, easily accessible way to organize my stickers. Currently I have them divided into categories but they’re not easily accessible. They’re all in boxes and drawers and it’s not ideal. I searched around the interwebs to find out the best “paper” to use and discovered that Reynolds Wax Paper is the best. I then found this tutorial by Knicnax on how to make a DIY Wax Paper Sticker Book. I found my wax paper, some cardstock and made my first Sticker Book. The tutorial was excellent and I think I’ll make a book for each category. I will also spend more time decorating the cover and labeling. I love the “bookstyle” for easy storage and accessibility. I’m always on the hunt for efficient and inexpensive organizing ideas especially for my craft supplies. If you know of any, please send them my way. Buddy and I would love to help you with the sticker book devoted to all your dog stickers. I mentioned the other day, just briefly, my obscure obsession with Composition Notebooks. I don’t know what it is about them, but I find myself using them for everything. For the past year, they’ve served as my go to planner notebook utilizing a bullet journal type system. And while they don’t have a lot of bells and whistles, they’re all I seem to need at the moment. I’ve written about my search for the “perfect” planner in the past here and here and here. Currently, this is the planner that I use. Because the composition notebook paper is thin-ish, I use a gluestick to glue two pages together and then secure the edges with washi tape. It’s my nod to mixed media and I really love the look. The best part of all: I use this planner EVERYDAY. I’m trying to keep all my notes, ideas, appointments, habit trackers all in one place and this seems to be doing the trick. I sit down every Sunday evening with a ruler and my favorite pen and map out my week. The nice part of this system is if I decide I want to add a tracker or change the different components around, I can. I’m not locked into a particular layout. That being said, I generally stay with the same layout, but I have changed it a bit over the past few months. I will use a book mark paper clip (a dog bone, of course) to mark the current week and can reference back if I need to previous weeks. If I have used a two page spread for note taking or setting up a chore tracker, then I just go to the next blank two page spread and set up my next week. As soon as I’m finished with this book, I’ll date it and open up a fresh notebook. Additionally, I’ve wanted to create a separate journal for all my projects – I call it my “Make Journal”. I’m using a composition notebook for this as well. I covered this one with fabric and attached a button enclosure. I dedicated the first 5 pages as the Index section and then am designating a two page spread for each project. One notebook with hold a total of 96 projects!!!! I hope that’s enough lol!!! I plan to use this as I work through the classes I’ll be taking through Craftsy/Bluprint. I love that all my project notes will be in the same place and I’ll be able to see which ones need my attention. At the moment I KNOW I have unfinished projects that are “out of sight, out of mind”. I want to gather them all up, decide if I’m going to finish them and then plug them into the Make Journal. I’d love to know what systems you use to keep track of your life/projects. Let me know in the comments below.